This beautifully furnished first floor end unit features hardwood flooring throughout the living and dining areas. We have a new sleeper sofa with upgraded gel mattress for 2016! We added new occasional chairs, area rug and lamps too. Bring your Netflix sign in so you can enjoy the NEW Smart TV in the living room The villa is super comfortable and has great views from the covered deck. The kitchen is nicely updated with custom cabinets and Silestone counter tops. The raised bar creates a great area for light meals and snacks. Enjoy a great nights rest in the king bed . There is a flat screen TV and private bath. A second full bath in the hall offers a shower . We love dogs and welcome you to bring yours ! FREE amenity cards. Free WIFI internet too!!! No landline in this villa. Cell phone use only. This is our third time staying at Pelican Watch and we will be returning in a few months. It is a perfect place to relax and recharge. From long walks on the beach, classes at the Lake House to charming Freshfields Village it is my very favorite place to be. The unit was perfect for our needs, could not asked for better views. Looking forward to our return next year. We found that one week was too short hope to stay at least two weeks next year. We look forward to coming to Seabrook every year. The villa is perfect for us and Seabrook Exclusives takes great care as well. A Seabrook vacation is a tradition we hope to enjoy for a very long time. The villa was great. Was ready when we got there. Clean! Will be staying there again. The bed could use a new mattress but being so busy through the day, we still slept fine. We have rented with Seabrook Exclusives multiple times and it is always an easy and seamless experience. 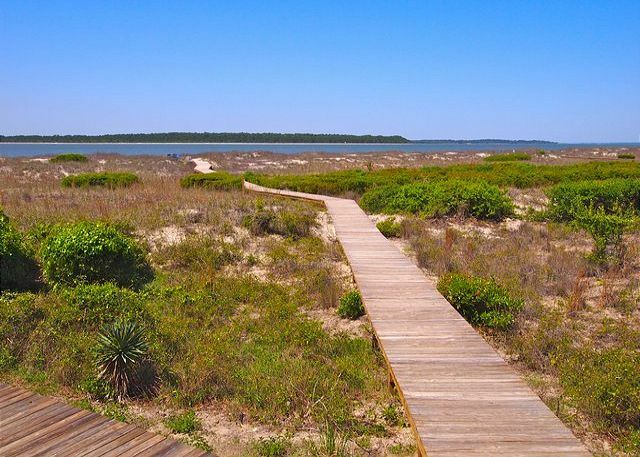 We like Seabrook because it is a private island and the beaches are nice and not crowded. We also like all of the natural wildlife for our children to experience. This was our first time in this particular villa and it was very clean and well kept. The living room furniture was brand new and was very very comfortable along with the master bed. Our only suggestions would be to add a booster to the wi-fi and provide bar stools at the counter. This villa was beautiful! All furnishings were new and quite comfortable. 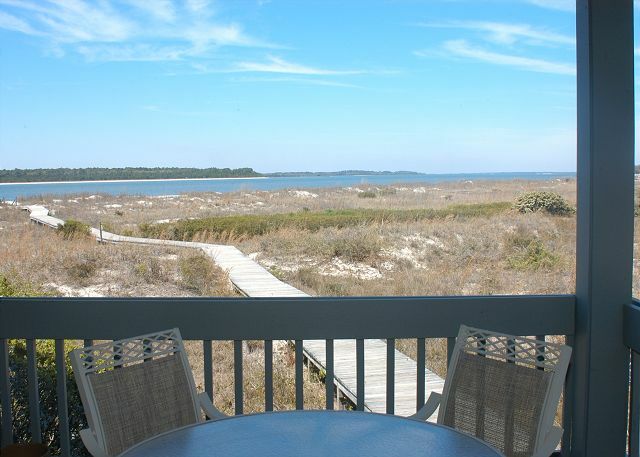 This was our first time at Seabrook Island, and we look forward to returning to this lovely island retreat. Nicely equipped, convenient first floor unit and pet friendly. Generally in pretty good shape. We had a wonderful stay, everything was perfect. The unit was clean and well maintained. Will definitely return. It was our first time on Seabrook Island, and we were truly delighted with all aspect of our stay. The condo was clean and very comfortable. Loved the beautiful and lush grounds. Very relaxing! We had a nice stay and were very appreciative of being able to bring our terriers with us. The air conditioning malfunctioned but was repaired promptly. I suggest getting rid of wall to wall carpet in master bedroom - the unit was very musty/mildew smelling when we arrived. Also, bed in master softer than I prefer but ok for 3 days. The coffee maker is a first generation Mr Coffee...time to upgrade!! Susan in the leasing office was GREAT!! We had a great vacation on Seabrook. The perfect family vacation with easy access to the beach and pool. We were greeted by deer on our early morning walks to the beach, and were fortunate to happen upon a loggerhead turtle nest boiling, which was an amazing site to watch the hatchlings make their way to the ocean. A great time. The condo was fine - comfortable, had all the creature comforts. it was the view! The dunes and then the ocean. Breathtaking! I have never seen a lovelier beach and I have been all over the world and visited thousands of beaches. The sand was so soft and clean and white. Stunning. Everyone I met was warm and jovial. My dog is super friendly and every dog we met, of which there were many, was friendly and playful. Seabrook Island is magical, and the condo was the perfect base. Pelican Watch is a great spot for a getaway. The easy access to the beach is a nice perk and thank you for being pet friendly! Our little guy had a blast! We had a great stay. The unit was very nice. We enjoyed the view from the deck. 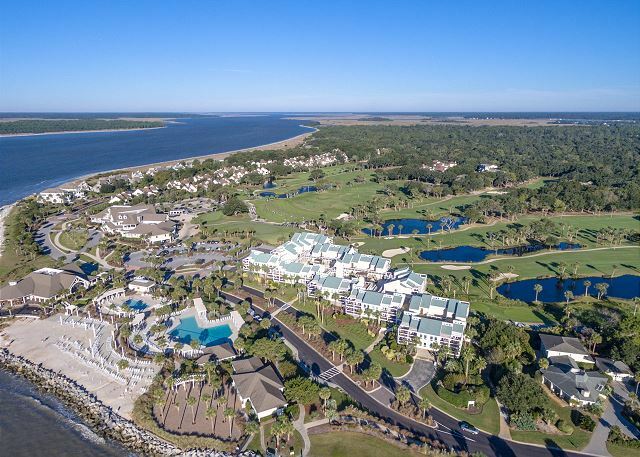 One of the most beautiful spots on Seabrook Island; fantastic views; friendly neighbors; great service from rental company. We really enjoyed this condo: the location was very convenient to get to the beach. Lots of people using the boardwalk located right beside this end unit. That was not a problem and we enjoyed being steps away from the beach walk. Condo was nicely furnished and the bed and linens were very comfortable. We would have liked HD service on the TV. Oh, and a pizza pan and pizza cutter. We loved Freshfields Village, especially the Harris Teeter. Loved the farmers market on Monday night. We thoroughly enjoyed Seabrook, the wildlife, and property owners attention to keeping the beach clean. We plan to go back! This was our first trip to Seabrook though we have visited most of the beaches around Charleston and have vacationed on Kiawah several times. We love the SC coast and Seabrook did not disappoint. It is laid back with breathtaking views and wildlife everywhere. We enjoyed watching the deer feed while sitting on the ocenfront deck. The villa is comfortable in a beautiful location. It was very clean with everything to make our stay perfect. We will definitely be back. Also, we enjoyed working with Betsey at Seabrook Exclusives; such a sweet lady!! Corner unit is located at the intersection of a beach access and boardwalk from parking area - very convenient. Lots of parking. Furniture in the living area could use some updating for more comfortable sitting. Would recommend owner invest in wireless access upgrade - signal not consistent from the bedroom - and an upgrade to HD TV. King size bed was very comfortable. Unit was spotless upon arrival and Seabrook Exclusives was super responsive to a minor TV problem we reported. Be aware that the unit above is a 3 BR unit - 4 adults and 4 children staying over the holiday weekend. Noise overhead is a risk with any 1st floor unit, though. Overall very pleased. Beautiful area with lots of wildlife - LOVE Seabrook! I visited Seabrook Island during the off-season for a "mini-vacation" following the stress and fatigue of a major geographical move and the start of a new job just 8 months earlier. Perfect place for the two of us. Convenient to beach and food as well as the golf courses. We come back over and over. This was the perfect rental for our vacation. It has everything you need and nicely decorated. Great place to stay at Seabrook. This was the most dog friendly beach I have ever visited! The condo was spotless. The only regret was that we forgot bug spray for the mosquitos. EXCELLENT.we had a very good time and the weather was very cooperative.Very convient to local grocery store,gas station,and resturants. Had a great time hope to see you next year. Really a neat place. The property was very clean and very well maintained.Great view from the pourch-right on the water.The staff at Seabrook Exclusives wasvery efficient and very helpful. We would definitely stay here again . We enjoyed our stay at Pelican Watch! The condo was very clean, well appointed, and had a great location. We loved having our pets with us...they enjoyed the walks on the beach so much! We will definitely be back! Property not up to standards due to mininimalistic style. LR Uncomfortable furiture. Kitchen Inadequite utinsils, glassware and dishes. The second shower didn't have any hot water, why? Notice should have been posted. We found the location about as good as it could be on Seabrook. The vista and first floor location were just what we wanted. I was able to park my bike on the back porch and still have easy access to the street. We did not get to our kayaking or rent a bike for Deb but loved our rides around the island and to Charleston and Edisto. The villa was just perfect for our vacation. Kat and her colleagues handled everything seamlessly. I cannot recommend the villa or our experience with Seabrook Exclusives highly enough. Already looking forward to next year! As usual the people at Seabrook Exclusives were GREAT!!!! Had a wonderful experience. Hope to be back SOON!!! So glad to see you at Seabrook Island again! It was great having you visit with us at Pelican Watch. I would recommend to anyone needing a getaway. Condo was clean and up to date. The only thing wrong was the table on the deck was falling apart. Thanks for your stay! We are replacing that table! We had lovely weekend trip. Great location and everything was as described! Really enjoyed it, we will definitely go back! Enjoyed everything about the island,the villa and the beaches. Will here from me again. The only slight problem I had was with the Bicycle rental (Surfscooter), will not use them again. I had to call to say the bikes were'nt there and he insisted they were, when they weren't. Lost a day of bike riding. Everything else was great. Already recommended the island for vacation to some friends. We stayed on Seabrook Island for our honeymoon. My husband loves it so much that he wants to move to SC now!! Everything was perfect and clean and the location perfect!! The wildlife is amazing!! We will definitely be booking this again for our anniversary! As usual a very good experience.Will be back next year if not sooner! Great stay at one bedroom unit. Close to beach walkway, and great view of sunsets and river. Owners provided some laundry detergent and extras that were appreciated. loved that we could bring our dog. very minor items: stain on bedroom carpeting, slow toilet in master bathroom. Beach chairs uncomfortable so we were glad we brought our own. Seabrook Island was a great new discovery for my husband and me this summer. Our unit at Pelican Watch was a few quick minutes of a walk from the beach. The views were georgeous-- beautiful ocean, wildlife (a doe on the boardwalk the morning we left), shrimp boats, and dolphins right off shore. The sunsets were glorious over the island across the river inlet. Pelican Watch and Seabrook Island together make a very peaceful, lovely get-away from the hustlle and bustle of everyday life. Thanks for sharing your beautiful, well furnished condo! Thank you for the little extras the Seabrook Exclusives Realty folks left for us that made our stay even more enjoyable. And, thank you for being dog friendly! Our best little buddy had a great time, too! This unit was very quiet and had a good view. 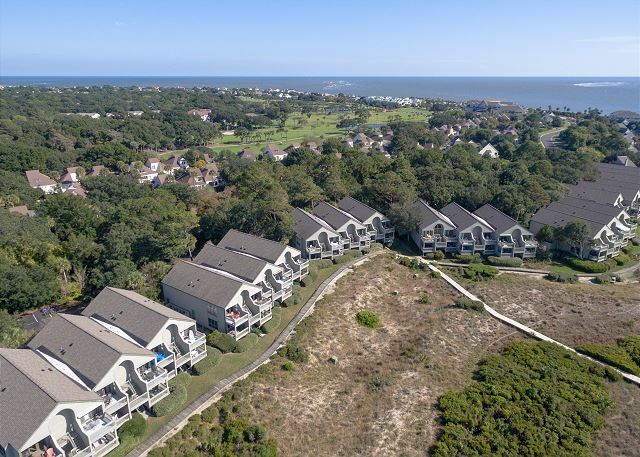 This first floor unit has a beautiful view of the ocean and is located at the intersection of two of the boardwalks, making it easy to get to the beach. It was great having our dog worked out well. She had a is a great way to vacation as long as the rules are followed, everyone had a wonderful time..Thank you to all..